Right, what is the nicest, most delicious treat in the world that makes me go ‘oh oui’ all the way?! A macaron of course! 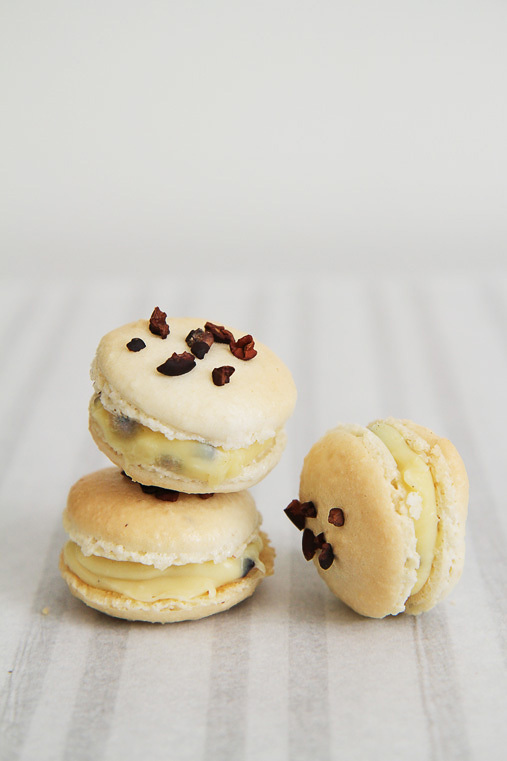 Macarons are these delicate little almond cookies, brittle to the outside, chewy on the inside and filled with all kinds of creams and pastes. Ladurée and Pierre Hermé are certainly names that pop into mind when you think of macarons – the two French pâtissiers have dedicated themselves to perfecting macarons, and always come up with new, imaginative flavours. Now, the interesting thing is that people always have this ‘fear of making macarons’. Everyone I speak to has a huge respect for macarons, thinking it’s the hardest thing ever to bake, convinced that they show off a baker’s talent. I say no way! 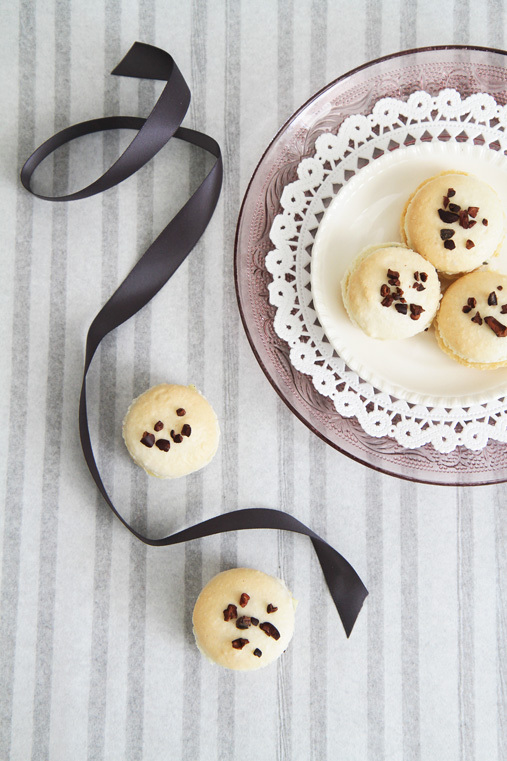 Macarons are as simple as baking a plain sponge cake! Seriously! You just need to follow a few very basic rules! 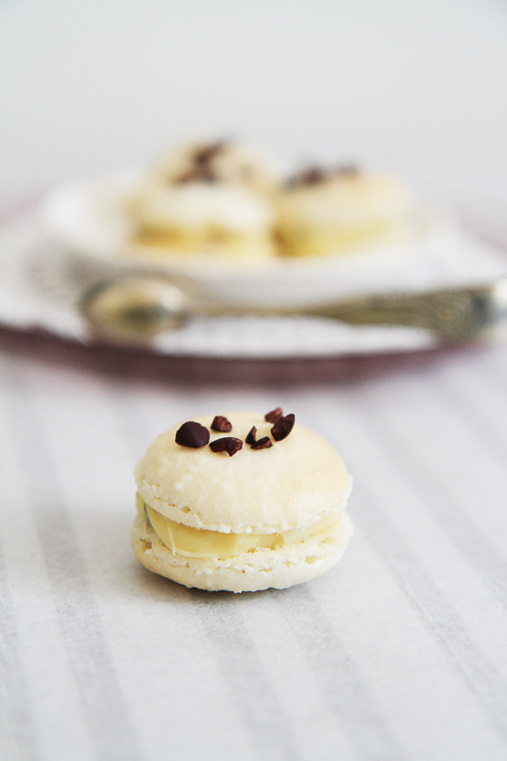 So, are you ready to make your first batch of macarons? Believe me, it’s so incredibly simple! The only thing you absolutely can’t do without in macaron production is an oven thermometer! Really, don’t even try to wing it, it won’t work! Full stop. No discussion. Get a reliable oven thermometer and monitor your temperature while baking – keeping it at a constant 160° celsius. The second thing is that you need to make sure your egg whites are at room temperature. Take your eggs out of the fridge the night before, and let them acclimatize themselves with the kitchen temperatures. And the third rule is that you need to let your macarons rest for one hour before sticking them in the oven. That will harden the outer shell, so that the macarons will rise in the oven and reveal their little ‘foot’ (the little frothy crown at the bottom). Also, I have found one more little thing: silicone mats aren’t ideal for baking macarons. I love silicone baking mats, since they are completely non-stick. But I have found that you just end up without any crisp bottom. So, the problem is that when you bake your macarons on a silicone mat, they always come out gooey on the bottom. That’s not a big problem if you don’t mind (and I don’t), but it’s just not the way it should be. So, get some really good baking paper, and bake them on metal trays – to intensify the heat and let them crisp up at the bottom. Now, I’ve told you so much about making macarons, and you still don’t believe me that it’s easy? Ok, I’ll prove it! I’ve shoot my first Anne’s Kitchen video this weekend (on the most amazing camera in the world: the Canon EOS C300!!!!). 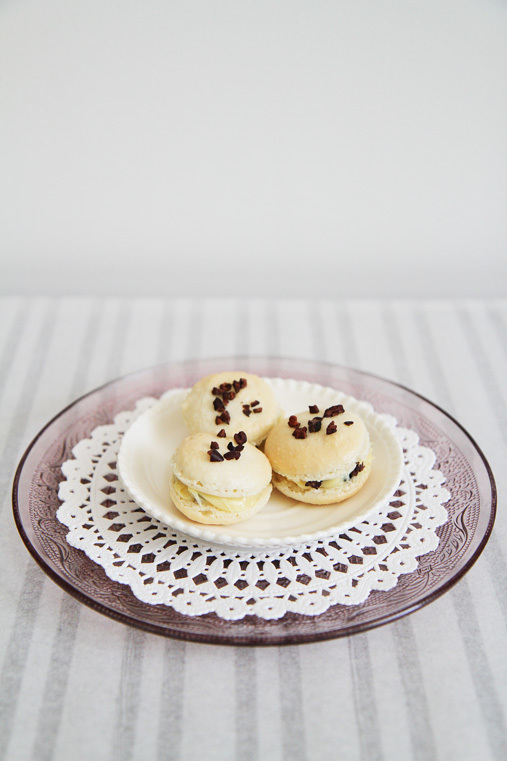 In it, you can get a cheeky peak into my little London kitchen, and watch me make these heavenly macarons. Ready, steady, go! Start by preparing the macaron shells. Beat the egg whites with an electric hand beater until they foam soft peaks, add the caster sugar and beat a bit longer. Sift the icing sugar and ground almonds into a bowl. Add the stiffened egg whites and carefully fold in with a silicone or wooden spoon. Don’t vigorously stir the batter, instead, carefully lift the mixtures into each other. Fill the batter into a piping bag, mounted with a round tip. Pipe little discs onto a baking tray, lined with baking paper or a silicone mat. Sprinkle cocoa nibs onto half of the discs. Let the discs rest for 1 hour before baking (this will harden their exterior, so that they create their iconic little foot when they rise in the oven). While the macaron shells rest, prepare the ganache. Put the chocolate, cream and butter in a saucepan and melt over a medium heat. Once the mix is smooth, take off the hob and stir in the cocoa nibs. Let cool down, and keep in the fridge until needed. Preheat the oven to 160° celsius (best use an oven thermometer to make sure you get the temperature absolutely spot on). If you can, put the baking tray with the macarons onto a second baking tray (this will generate more direct heat to bake the bottom of the macarons). 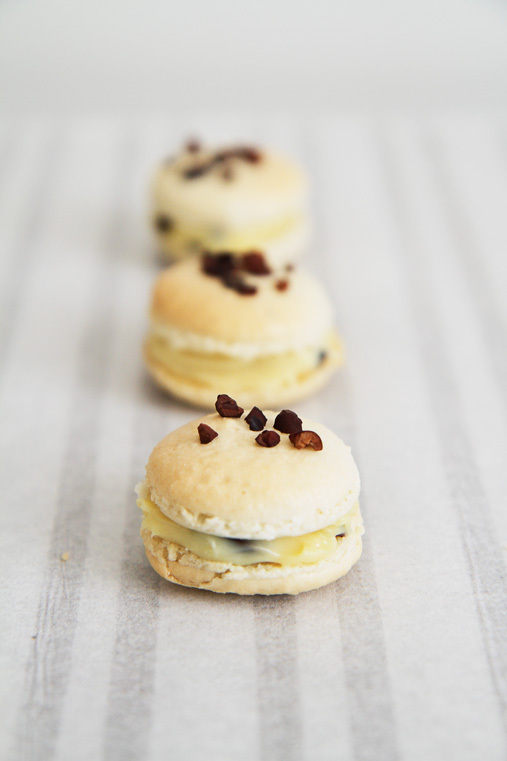 Bake the macarons for 10-12 minutes, until lightly golden. Take out of the oven and let the macarons cool down completely before removing them from the baking paper. 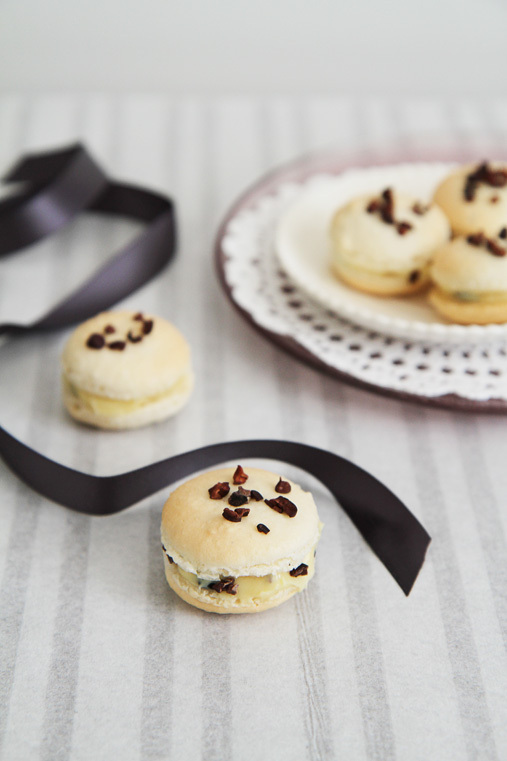 Spread a bit of the chocolate ganache onto a bare macaron shell, and top with a cocoa nib shell. Store in the fridge until needed. These will keep up to 3 days. I am a student in National Diploma in International Trade in Marguerite de Valois high school (Angoulême – France) and I have to do a work placement of eight weeks abroad. My main mission is to make the customer Prospection. Your Company has an excellent reputation and it provides excellent training. My enthusiasm and my serious will be benefic for your company. It’s will be an opportunity to work in your firm to improve my experience professional in an internship overseas and can allowed me to improve my language skills. The work placement will start in 12 May until 4 July. This internship must be unpaid. I give you my mail to contact me if needed.